We have seen, in the above example, that when a conductor is moved in a magnetic field a motional emf is generated. Moreover, according to Worked Example 9.3, this emf drives a current which heats the conductor, and, when combined with the magnetic field, also gives rise to a magnetic force acting on the conductor which opposes its motion. In turns out that these results are quite general. Incidentally, the induced currents which circulate inside a moving conductor in a static magnetic field, or a stationary conductor in a time-varying magnetic field, are usually called eddy currents. 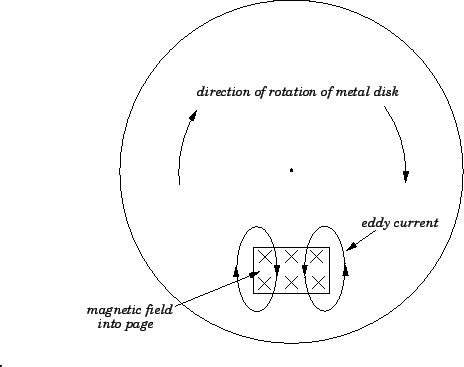 Consider a metal disk which rotates in a perpendicular magnetic field which only extends over a small rectangular portion of the disk, as shown in Fig. 37. Such a field could be produced by the pole of a horseshoe magnetic. The motional emf induced in the disk, as it moves through the field-containing region, acts in the direction , where is the velocity of the disk, and the magnetic field. It follows from Fig. 37 that the emf acts downward. The emf drives currents which are also directed downward. However, these currents must form closed loops, and, hence, they are directed upward in those regions of the disk immediately adjacent to the field-containing region, as shown in the figure. It can be seen that the induced currents flow in little eddies. Hence, the name ``eddy currents.'' According to the right-hand rule, the downward currents in the field-containing region give rise to a magnetic force on the disk which acts to the right. In other words, the magnetic force acts to prevent the rotation of the disk. Clearly, external work must be done on the disk in order to keep it rotating at a constant angular velocity. This external work is ultimately dissipated as heat by the eddy currents circulating inside the disk. Eddy currents can be very useful. For instance, some cookers work by using eddy currents. The cooking pots, which are usually made out of aluminium, are placed on plates which generate oscillating magnetic fields. These fields induce eddy currents in the pots which heat them up. The heat is then transmitted to the food inside the pots. This type of cooker is particularly useful for food which needs to be cooked gradually over a long period of time: i.e., over many hours, or even days. Eddy currents can also be used to heat small pieces of metal until they become white-hot by placing them in a very rapidly oscillating magnetic field. This technique is sometimes used in brazing. Heating conductors by means of eddy currents is called inductive heating. Eddy currents can also be used to damp motion. This technique, which is called eddy current damping, is often employed in galvanometers.